I am SUPER excited with the way this table turned out and I had to share it with you all! There we were, in a stalemate. Finally I offered a compromise: We could keep the table, but I asked if he would be ok with me refinishing it. He obliged and that brings us to today! I had seen a lot of tables on Pinterest that I fell in love with. 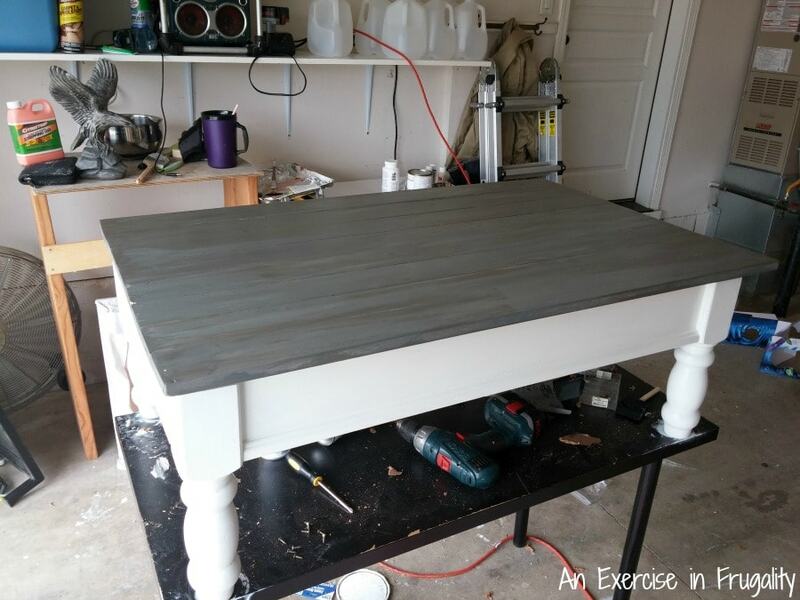 I decided I really liked the ones with grey wood tops that looked like aged barnwood, like the ones by Restoration Hardware, so I got to building my faux barnwood coffee table top. I rebuilt the top by using 1×4 lumber. The wood was super inexpensive. I believe it was $2.88 per board at Lowe’s. Once it was all glued together, I used some spare wood to build a brace around the back side to make it sturdy. Then I bought some grey wood stain to make it look like an aged barnwood coffee table. Unfortunately, the wood stain I bought was too “blue-grey” for my taste. 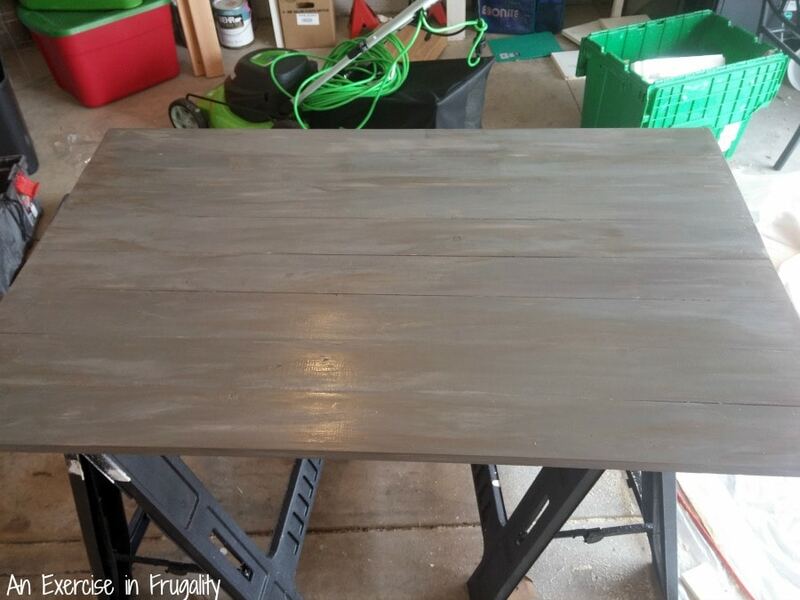 I wanted a warmer grey so I improvised: I used 6 different shades of grey paint to create the look of aged wood. I also used a bit of dark brown mixed with grey to make it look worn and discolored. I wanted the feel to be like it was reclaimed barnwood, without having any barnwood to use. After the paint was dry I sanded gently with a fine sand paper to distress it. I wiped all the dust off then I used three coats of clear coat on the top to ensure it is water-tight in the event of any spills. 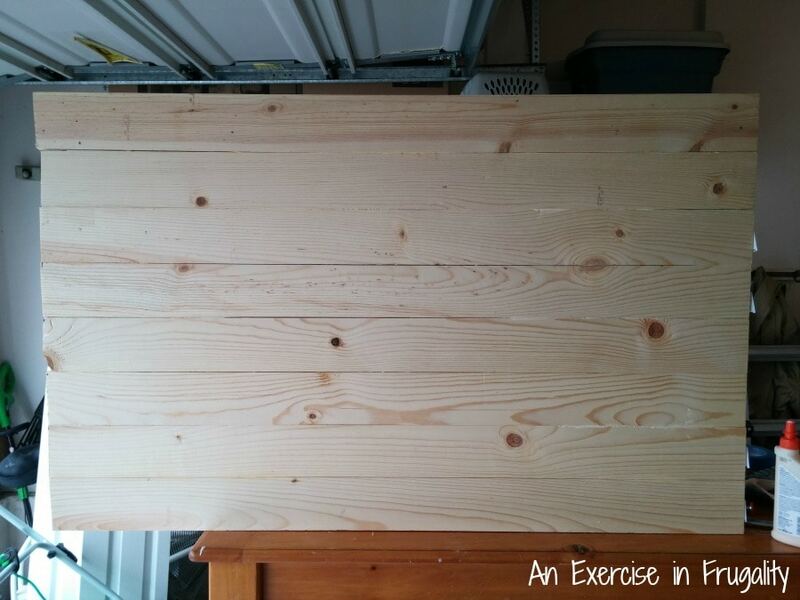 If you’re using a coffee table that has a good top already, you can skip the building step and just strip and sand as you did for the base. Then I stripped the base, sanded it, and repainted it with white latex paint. Two coats and we were ready to rock and roll! I kept the moving mechanism in tact, by simply unbolting the existing top and removing it. That left the brackets in place and I simply reattached the top and VOILA! Here’s the finished project. I think it only took me a few hours of active work time, not counting the time it took for paint and clear coat to dry. 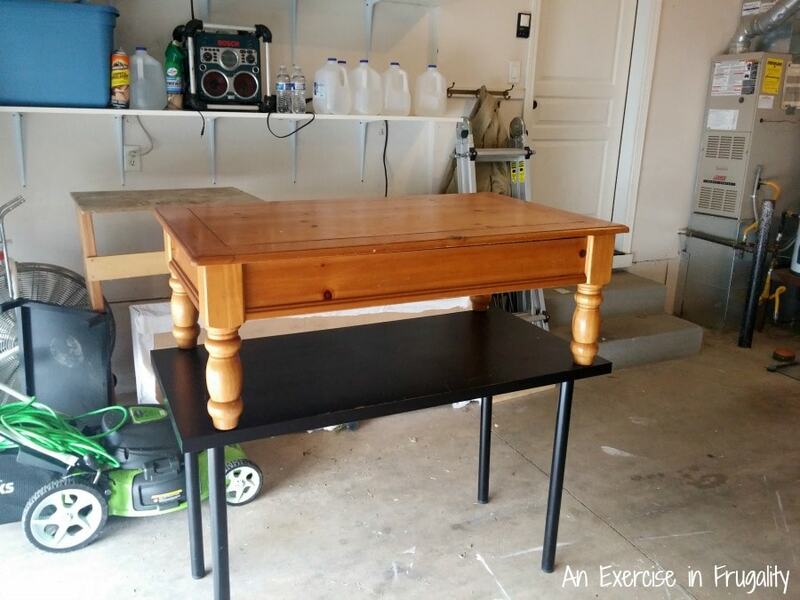 It saved us a lot of money to refinish this table versus buying a new one. Plus this is totally custom and unique! It wasn’t hard to do at all, anyone who can use a saw and a drill can definitely make something similar. We’re thrilled with the results! 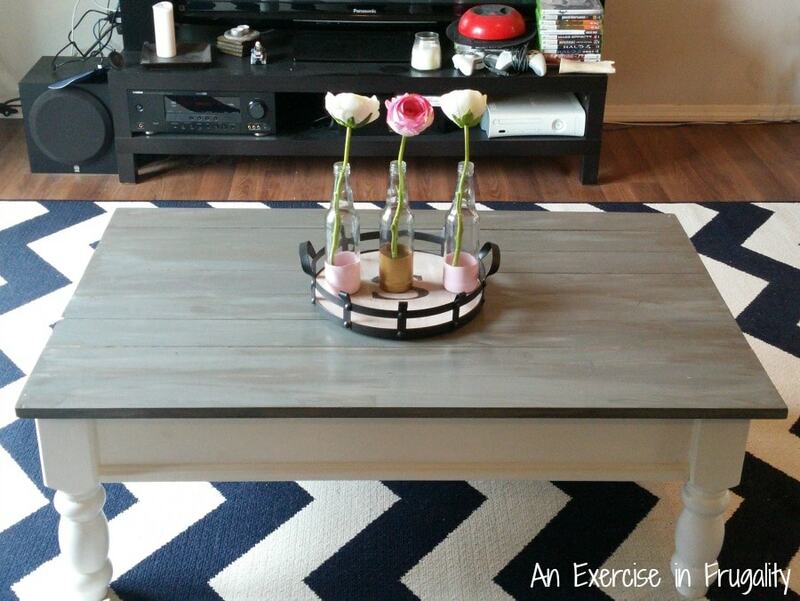 What do you think of my faux barnwood coffee table? WOW! This is beautiful! You could sell this for a lot! Great job! I really love what you did! Wish I could do the same. I am absolutely love with this! It came out awesome. This came out great. I have a coffee table that needs to be redone. I think you did a really incredible job. 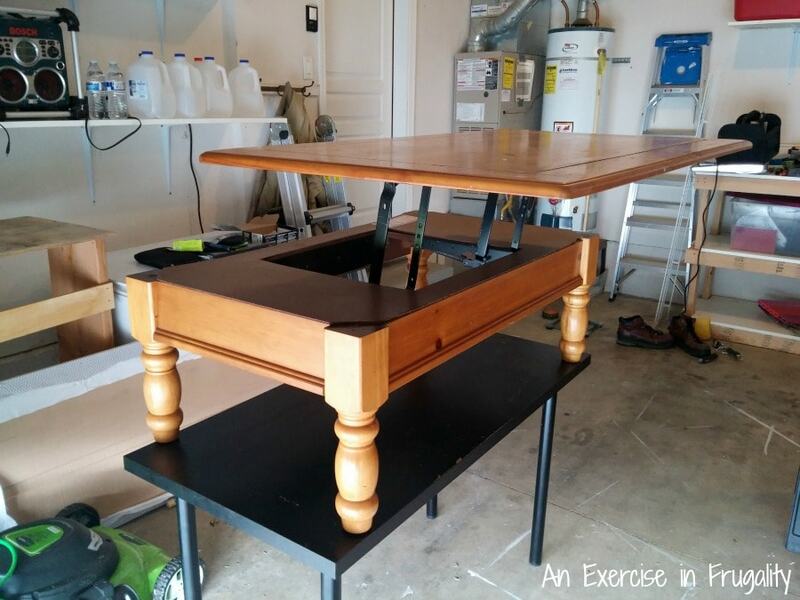 We are in need of a new coffee table – I think it’s been ten years since we got a new one! Looks awesome! 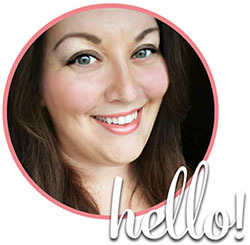 I love how it turned out, thanks for sharing! Goodness, I love your coffee table. I love eclectic decor and all things barnwood inspired lol. Thanks for the great idea, I have something in mind now that I’d love to try. It involves my kitchen table though. I love how well this turned out! We really need to refinish our kitchen table as it’s starting to show it’s age. I really love it! You did an amazing job. It looks completely different and so much better now. That is beautiful. Way better than any table I’ve seen in a store, I love it! Could use one in my new house! Wow it turned out great! I love the country look it has! 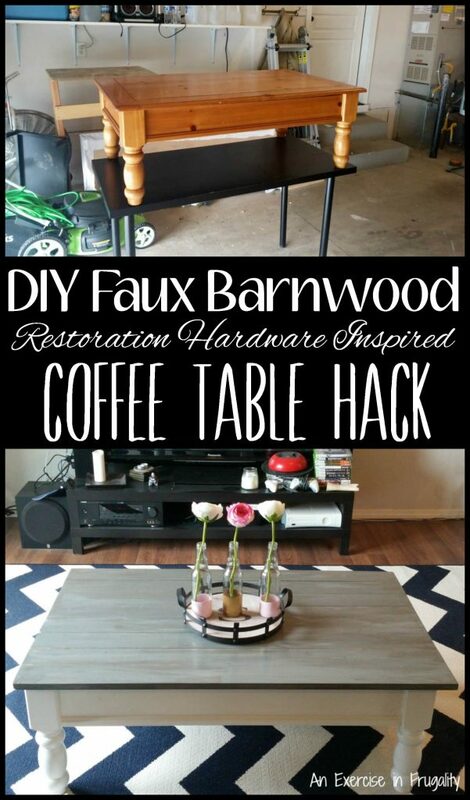 I’ve always wanted this type of coffee table and I absolutely love what you did with it! I think it goes really well with the decor I see in the background of your pics! I cant even begin to explain how much I love this. It is beautiful! This ended up looking so nice! I love the colors you went with. WOW that turned out fantastic – thanks for the step by step – love the result. It does look great! I don’t think I’ve ever seen a table that came out like that though, on the hinges. Very cool! It’s fantastic! I would totally buy that in a store actually! Well done Rose. I love it! !